"In every field, students must strive to become ideal leaders and guides. The students of today are the citizens of tomorrow who will shape the destiny of a nation. When the students grow straight and strong, every aspect of the country will become efficient and beneficent. MY SCHOOLS have been established to achieve this purpose." Education refers to collection of worldly facts, Educare is to bring out the latent Divinity in Man. The Word "Education" is derived from the Latin root "Educare". Education is for a living while Educare is for life. Education is for "Jeevitha Upadhi" (livelihood). Educare is for "Jeevitha Paramavadhi" (the ultimate goal of life). Educare is a systamatic activity of bringing out and developing to the degree of highest perfection the varied innate potentialities the student has in him. At Sathya Sai Schools in India and across the Globe, Education is for Life, not merely for a Living. The model of integral education at Sathya Sai schools help students develop a wholesome and balanced personality, one where academic competence is supplemented with good character, noble attitudes and values, social sensitivity and spiritual awareness.What makes Sai Students distinctive from students of other schools is not just the training of their minds, but also the transformation of their hearts. Fostering the belief God is one, Love is God inculcates Unity of Faiths among children. When Bhagavan declared His Divine Avathar at the age of fourteen, He visualized a world of peace and happiness. It is His concern for the good of entire mankind and for the re-establishment of 'Sanathana Dharma' that He took human form.In 1947 Bhagavan declared that His Sanathana Dharma rests on Four pillars – Sathya, Dharma, Santhi and Prema. These are the Four Primordial Principles of Sri Sathya Sai Educare. Insightful, Inspiring, Enjoyable and Participative value-based Digital Classrooms. Sri Sathya Sai Vidya Vahini's fundamental focus is in making schools, a place that facilitates holistic and integrated learning to enable transformation and character building as envisioned by Bhagawan Baba. The programme is an initiative by Sri Sathya Sai Central Trust, Powered By Tata Consultancy Services. The 1st school to introduce Bluetooth I'Card and launch dedicated App for school in Thiruvottiyur. Attendance, Home works, Pictures & Video gallery and school transport GPS tracking and much more, all in one single App. Parents can also contact the school on the App on any queries round the clock. The Sri Sathya Sai Vidyalaya is inspired, initiated and is lovingly nurtured by Bhagawan Sri Sathya Sai Baba. He is its Life and Soul, Motivation and Goal. Under His guidance and loving care, the school embarked on its mission of molding young minds on 24th April, 1987 and has been in pursuit of excellence since then. The school has been producing State Ranks and 100% pass percentage in board exams and as well as in levels all through. Sathya Sai provides a secure, challenging yet supportive learning environment in which Students gain confidence in curriculum and beyond by involving in a host of activities. * To be Affiliated to CBSE, NewDelhi. Our open door policy is the foundation upon which we build excellent relationship with our stakeholders. The person who benefits most from this positive collaboration is none other than the student. WHY WE LOVE SATHYA SAI? What is it like to be a Sai Student? When the word ‘extra’ precedes the word ‘ordinary’, it gives a whole new meaning, ordinary gets transformed into extraordinary. So does the word ‘Sai’ to a ‘Student’. Am blessed to be a SAI STUDENT. Sathya Sai is a great place to learn. There are many opportunities for once-in-a-lifetime experiences. Lessons can very often be entertaining as well as educational because of the approach that teachers take. Sathya Sai opens a wide variety of doors; I have discovered strengths I never knew I had. It never feels as though there are massive steps from year-to-year. That’s because the teachers prepare you so well. Sathya Sai is like one big family…. A very nice one! As we progress through the school, students are encouraged to use their initiative and develop self-discipline in their studies. Our school’s high academic standards and family atmosphere helps to nurture a love for learning that brings out the best in all students. Sathya Sai has helped me grow into a young adult both spiritually and academically. Sathya Sai teaches the students to do the right thing – even when no-one is looking. Sathya Sai has been the place where I’ve made numerous lifetime friendships and feel prepared for college and the career world. Thanks to teachers who have encouraged and supported me. Teachers create a highly positive climate for learning. They expertly harness students’ unquenchable thirst for knowledge by a range of highly creative learning activities. Everything at Sathya Sai is designed to encourage students to take an active role in their learning. Sathya Sai is precisely what a good school should be. Sathya Sai is a community. Every day presents a new challenge and everyday students and staff work together to overcome them; it’s what makes being a teacher here so rewarding! It’s the people inside Sathya Sai make it a special place. The young people who are fun, brilliant, hardworking, and make me smile, and my amazing colleagues who inspire me every day. "சத்ய சாய் பள்ளியில் ஆசிரியையாக பணியாற்றுவது ஓர் உன்னத அனுபவம். ஆசிரியர்களும் பெற்றோரும் ஒருங்கிணைந்து ஓர் குழுவாக செயல்பட்டு மாணவர்களின் கல்வி முன்னேற்றத்திற்காக செயல்படுவது பள்ளியின் சிறப்பம்சம். சக ஆசிரியர்களின் ஒத்துழைப்பும், பள்ளி தலைமையின் சீரிய வழிகாட்டுதலும், மனிதவள மேம்பாட்டுடன் கூடிய கல்வி முறையும், சமூக சேவை பணிகளும் இப்பள்ளியை திருவொற்றியூர் நகரின் திலகமாக, ஓர் சிறந்த கல்வி நிறுவனமாக விளங்க செய்கின்றது. சத்ய சாய் பள்ளியில் ஆசிரியையாக பணிபுரிவதில் நான் பெருமிதம் கொள்கின்றேன்." This is the school that helped to shape my future when I studied here. Now I get to be part of the teaching team shaping the next generation in our school by raising students’ self-belief, motivation, work ethic, dreams and aspirations. The children are constantly learning in highly engaging lessons that are planned around cross-curricular themes. With so many experienced and dynamic teachers, broad curriculum, creative learning strategies and shared work areas; the school is always buzzing with enthusiastic children involved in collaborative and exciting activities. The school’s drive towards being mission driven, espousing the values of ‘Educare’ and developing holistic education for life beyond simply examination results and curriculum attainment means youfeel like you are really making a difference. Am proud to be a Sai Teacher. At Sathya Sai, the primary focus is on discipline. The same is inculcated through direct and indirect methods of value education. Students are encouraged to form groups and perform lot of activities. Students learn by doing out of experience and teachers act as facilitators. Senior students are given ample opportunities to take leaderships and be mentors and role models for their peers and also for their juniors. Being at Sathya Sai School is a great learning experience, even for teachers. Moving the process of teaching and learning away from the traditional, didactic method towards a value-based, interactive and interdisciplinary approach provides our students with the higher order thinking skills, so crucial to their success. A Sathya Sai school education offers what other schools cannot, a learning experience rooted in reverence, respect and responsibility and a value-based curriculum focused on academic excellence that paves the way for future success. It certainly is a school unlike any other. It was truly amazing to see such consistently high quality, professional commitment and expertise throughout the school that was reflected in the children’s very impressive standards of work and behavior. Students demonstrate a confident approach to their work. They enjoy learning and are eager to achieve. Students are keen to answer questions, participate in activities and enjoy being challenged. The school achieves the right balance between working hard and having fun. My daughter thoroughly enjoys school – Sathya Sai is a great place to be, for every child. It has been good to see the confidence and goodness in our son grow over the years and also the enjoyment that he has while learning.My son is a member of 5‘O Clock club at school, a beautiful initiative to inculcate the habit of waking up early among children. The behavior of students is exceptional both in and out of classrooms; they are welcoming, courteous and respectful towards each other and to adults. The dedicated School App keeps me connected with the school and teachers throughout the year. This is an outstanding school. What makes the school special is that as soon as you walk in, you get a burst of positive energy. The school works hand-in-hand with parents, Parents Audit Committee is one among the many novel initiatives that makes Sathya Sai unique from the rest of the other schools. A very welcoming school, very friendly and approachable teachers. The school arranges educational loan on lowest interest rates for the needy parents. Thank you so much for your amazing support and help whenever needed. Teachers know their students extremely well and employ a wide variety of different styles and activities. I know if my children need extra help, they will get it. Thanks a ton. Thank you for providing a thriving school environment for my children. It has been the source stimulating learning, rich relationships, stimulus for personal growth and fodder for lively discussions around the dinner table. The Sathya Sai schools’ values encourage students to do their very best, in both their work and their behavior. Sai Store A.K.A Honest Shop run by students, Insurance coverage for all students are some of the initiatives that made me admire the school. Sathya Sai is truly a thriving school. I highly recommend the kindergarten because of its outstanding staff and facilities.Staff are professional and caring. It is clear that they are doing their very best to provide an outstanding education for my children. My daughters will keep amazing life long memories and friends from their early years. A vibrant and friendly school where children enjoy an exciting range of opportunities and make excellent progress. Cross Country conducted at school develops creative writing and public speaking skills of students in an amazing way. It is clear that the welfare of the students is at the heart of all that the school does. Many thanks for all you do, your support, care and respect mean everything to our family. Also, I am so proud and happy that my children study in the school where I studied. A strength of this school is the enjoyment and achievement of the students. Visitors to the school cannot fail to be impressed by the students’ outstanding personal skills, including their exemplary behaviour and attitude to school. Students are involved in lot of social service activities that makes them compassionate towards the under privileged. Provision for students’ spiritual, moral, social and cultural development is outstanding and students are well-prepared for moving onto the next stage of their lives. The role of Spiritual Diary in molding the children is noteworthy and it acts as a magic wand in transforming the children. My daughter has returned to being a happy child again. She has stopped many of her former signs of distress. She speaks sweetly and softly to us, does PadhaNamaskar every day and help us in household chores. Thank you Sathya Sai. Sathya Sai provides an exceptionally high quality of education and care and students are kept extremely safe. CCTV surveillance campus, RF enabled ID cards and Parent ID cards ensures safety of students to the core. Involving parents in all the school activities enable the students make excellent progress both academically and personally. Staff are professional, caring, highly dedicated, and approachable and this is evident in the way that they interact with the young people. There is a lovely atmosphere and the young people obviously feel safe and secure. The staff at Sathya Sai continue to show immense patience and perseverance in meeting my children’s need as well as encouraging them to be more assertive and independent. The school leaves no stone unturned in the pursuit of enabling students to make the maximum progress.Interesting and innovative initiatives are many, targeting one goal – to make the students achieve beyond all expectations. Our daughter’s enrollment at Sathya Sai was the start of a new life for us. Today we are happy parents. I’m so proud of all that my son has achieved with you and will be forever grateful for the wonderful start you and all your staff have given him in life. May we take this opportunity to personally thank you and all the staff for providing a wonderful environment for both our children and giving them a better start in life than we could ever have hoped for. My children have always enjoyed their time spent in school. As a parent I am very satisfied. I can trust that my daughter is receiving the highest level of academic support, quality education and behavioural guidance while building a loving foundation and lifelong friends. The teachers keep us well-informed of their development, creating a learning atmosphere that was consistent in the classroom and at home. Engaging, nurturing, compassionate and professional are amongst the many words we can use to describe this outstanding school and staff. My daughter is coming on in leaps and bounds since joining the school and regularly tells me what she has learned. The school feels like a community – caring and friendly. The feedback from teachers is objective and you always feel that they have a clear plan. I found the school by a stroke of luck and I’m really pleased that I did. I’m absolutely delighted that my daughter attends Sathya Sai. I don’t think she’d be the happy, confident and polite girl she is without the influence of Sathya Sai. My daughter is so content at school that she can’t bear to miss a single day. Thank you for everything that you do for the students and especially our daughter.Sathya Sai makes every student feel special and important – this is rare to find in both a school and its staff. Both my children study in Sathya Sai. The concept of unity of faith is something that makes this school very unique. My children pray as per our tradition at school and Ramadan is celebrated in a grand manner every year. Quality education along with values for life is what my children get at school. Am so happy that my daughter is an ASSET award winner at school. May Allah bless this school grow from strength to strength. 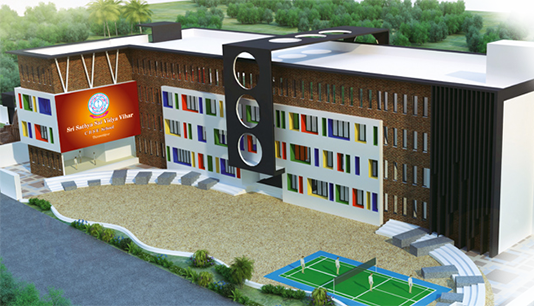 Sathya Sai School is one of the most structured school, innovating in every way possible. The school promotes lot of extra-curricular activities. We are proud to be associated with this wonderful school. Share our values, set your compass and start your journey with us. Together lets build exciting opportunities for our children.